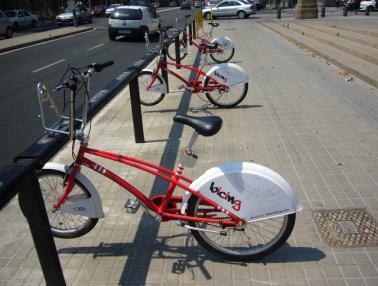 Bicing is a new bicycle transport system created by Barcelona Council. It consists of a public bike hire scheme that allow users to hire a bike for a limited amount of time (up to 2 hours). This transport system has been designed to cover short journeys. Bicycles can be picked up and dropped off at any of the stations all over Barcelona. First 30 minutes are included in the annual fee (€30), after that and up to a maximum of 2 hours, the price is €0.50 per half hour. There are 400 stations with 6,000 bicycles all over Barcelona. The picture above shows a bike station. Unfortunately, this service is just available for locals as registration is required. Ir order to be able to use this service so you have register online. Once registration has been completed you will receive a card that will allow you to hire the bikes. However you have to be aware of the penalties caused by not returning the bikes or using them for more than 2 consecutive hours a day. Bicing service schedule is the same as the metro timetable. Click here for further information regarding price, conditions, map of bike stations, availability, penalties. Unfortunately this website is just available in Spanish or Catalan.